The issue opens with the scene of a man, covered in rags, emerging from the swamp. The fellow thinks of himself as being a monster and he’s leaving the bog now that the weather is getting colder and seeking refuge in the nearby, abandoned industrial park. The Turtles and Casey have arrived at the very same complex to do some exploring. The guys hop the fence and walk around the grounds. Mikey mentions stories that say the place is haunted, but everyone scoffs at the idea. The bedraggled man spies on our heroes from above, noting that he was The Ghost last year – this year, he is The Monster – and if the rats don’t get the intruders first, he’ll make his presence known. The Monster is shocked when he finally gets a good look at the Turtles, thinking that they’re a gang of beasts that have come to take his territory. The Turtles note a surprising lack of vandalism and trash around the grounds of the industrial complex, considering how many teenagers would normally hang out at a place like this. Maybe the ghost stories frightened people away? Mike thinks he sees something and leaves the others to investigate on his own. As the Turtle walks through a doorway, the Monster clubs him on the back of the head, knocking him senseless. Mikey awakes tied to a table, the Monster leering over him. The crazed man accuses Michaelangelo of trying to take the place for himself, which Mike flatly denies… but the Monster won’t believe it. The strange man leaves Mike tied to the table, telling him that he’ll have to spend the night that way to think things over – and perhaps – be eaten by the rats. With that, the Monster departs, leaving Michaelangelo alone. Mikey yells for help, but the others are too far away to hear him. The man has climbed to the top of a tall chimney and listens as the other “monsters” call for Mike, to no avail. As the sun sets, the Monster decides that he’ll have to kill the others to keep his homestead. Mike struggles with his bonds, but he can’t break them. Dozens of rats begin emerging from the broken brick walls as night sets in. Startled, Mikey focuses all of his strength and manages to break free! Suddenly, the rats attack the Turtle! The mutant battles diligently, but he loses hope as the supply of rats seems endless. Before all is lost, Don, Leo, Raph and Casey arrive and kill enough rats that the other rodents flee back to their holes. Michaelangelo explains what happened, and the Monster reveals himself. The guys chase their adversary and arrive at a giant silo. As soon as they enter, the group spots their quarry, standing on the ledge of the silo, high above their heads. The Monster pulls a rope and the doors slam closed behind our heroes, trapping all inside. The Monster explains that he’s been bringing food to this silo to feed the rats, in effort to get them to do his bidding. While that hasn’t worked out as planned, he’s still continued to feed the expectant rodents. 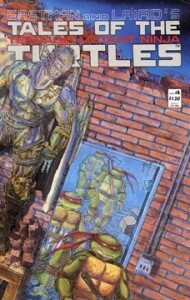 On cue, hundreds of rats begin scrambling out of the cracks in the walls and attacking the TMNT and Casey. The guys do their best to fight the pesky pests, but they’re severely out numbered. Mikey makes a mad dash towards a wall of the silo and actually manages to break through the old brick wall. As the guys exit the silo, Leonardo pulls a shuriken from his belt. Mikey yells at him to wait, but Leo launches the throwing star at the Monster, and it embeds into the man’s chest, knocking him from the ledge and into the silo. Mike moves to investigate, but Don pulls him back. Mikey doesn’t want to leave the Monster alone with the rats, but Don states that there’s nothing that they can do now. The guys walk off as the moon begins to set. Inside the silo, we see the Monster sitting quietly. Several rats surround the man, but they do not attack – The Monster has become… The Rat King.